This is the blog supports the book. If you need the book, check out this page with ordering information (eBook, in bulk, from Amazon, etc.). 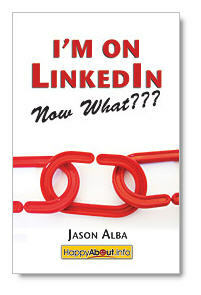 Authored by Jason Alba, with Executive Editor Scott Allen, this book helps you get the most out of your LinkedIn experience and understand where it should fit into your networking strategy. Jason is the CEO and founder of JibberJobber.com, a career management website designed to empower professionals with powerful career tools. Even though he had done “all the right things” to have job security, including earning a technical degree and an MBA, having big flashy job titles and a strong resume, and having a list of achievements and recommendations, Jason could hardly land a job interview, much less a job. He broke down the job search process and found that there was a lot of consistency in the advice, but no one had a tool for the job seeker (aside from 3×5 cards, a legal notebook or an Excel spreadsheet). Jason took as many ideas from the principles, combined it with the CRM concept (Salesforce.com, ACT!, Goldmine, etc.) and developed a real, industrial-strength tool for the job search, and network relationship for individuals (employed or not). His work has been recognized by the Wall Street Journal’s Career Journal, Money Magazine, CIO, hundreds of blogs and dozens of newspapers and radio stations. To get a free JibberJobber account, click here. To learn more about JibberJobber, check out some of these videos.